A major outbreak of gastroenteritis has laid low some of the world’s best athletes participating in this year’s IAAF championship held in London. Regrettably, this outbreak has already resulted in some of the athletes missing out on what could be have been the pinnacle of their careers with potentially far reaching consequences that will last long after the competition closes. Whist the precise source remains a mystery, the hospitality sector is bracing itself for the inevitable backlash. During a busy service, it’s not always easy for chefs or servers to drop their responsibilities and find soap and water and wash their hands, yet these simple procedures can dramatically reduce the chances of an outbreak of the norovirus or gastroenteritis. Gastroenteritis and the Norovirus- sometimes referred to as the vomiting bug is more common than you might think with almost one million Brits affected every year. 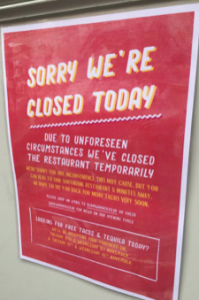 This year outbreaks have risen to their highest level since 2011 with Wahaca’s closure of fourteen of its restaurants being the most high-profile casualty. As specialists brokers within the Hospitality sector, we at James Hallam are acutely aware of the financial and reputational consequences of such an outbreak and the potential health implications for any sufferers. As Hospitality & Insurance specialist brokers we know the dangers, and unlike other polices on the market our Gauntlet package contains as standard, cover for loss of income and public liability for the Norovirus ,Gastroenteritis and Legionella. Whilst we at James Hallam mitigate against a worst-case scenario we work tirelessly with our clients to minimise the risks. Our philosophy is to work with our clients to build an understanding of risk, by advising our clients on best practice and by ensuring its implementation we keep premiums low and thankfully incidents rare. is based on tried and tested protocols- that’s why James Hallam is the Broker of Choice for the Hospitality Industry. James Hallam Hospitality and Leisure is a trading name of James Hallam Limited who are authorised and regulated by the Financial Conduct Authority.